"Contractors in the U.S. commercial construction industry are optimistic about the current state and forward-looking health of the sector, noting a healthy balance of project backlog and projected growth, which indicates overall strength and confidence in the market," according to a new Commercial Construction Index that USG Corporation and the U.S. Chamber of Commerce introduced  on Thursday. 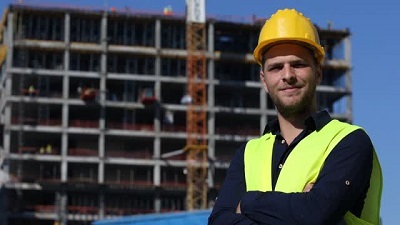 The index reflects the responses between April 12 and 20 to an online survey by Dodge Data & Analytics of prime contractors (49%) and trade contractors (51%) that "do projects in the commercial and institutional sectors (including multifamily residential)." The second-quarter score of 76 on a 0-to-100 scale (up from 74 in the first quarter) is based on three equally weighted components: the mean of each respondent's ratio of current backlog to optimal backlog; "the mean of all responses, on a scale of 1-10, to the question 'How confident are you that the U.S. market will provide your company with sufficient new business opportunities?'" and the "mean of contractors' ranges of expected revenue growth/decline [transposed] to a 10-point scale." Commercial construction is defined as "office, retail, hospitality, education, healthcare, multi-family residential (mid and high-rise), government, warehouses, airport terminals and other transportation buildings." The results cover 204 responses. The value of nonresidential construction starts increased 2.0% y/y from May 2016 to May 2017 and 1.9% year-to-date (YTD) for the first five months of 2017 combined, compared with January-May 2016 starts, data provider ConstructConnect reported  on Tuesday. Nonresidential building starts (65% of the YTD total) declined 2.2% y/y and 7.8% YTD. Commercial building starts fell 8.3% YTD; institutional building starts slipped 1.2%; and the small industrial building starts segment tumbled 29%. Heavy engineering (civil) starts (35% of the total) jumped 10% y/y and 27% YTD. Housing starts in May declined 5.5% at a seasonally adjusted annual rate from the April rate but increased 3.2% YTD through May, the Census Bureau reported  on Tuesday. Single-family starts slid 3.9% for the month but rose 7.2% YTD. Multifamily (buildings with 5 or more units) starts dropped for the fourth month in a row, by 9.8%, and declined 5.4% YTD. Building permits, a fairly reliable predictor over time of near-term starts, fell 4.9% for the month but increased 5.5% YTD. Single-family permits sped 11% YTD. Multifamily permits decreased 4.4% YTD. The producer price index (PPI) for final demand in May, not seasonally adjusted, increased 0.1% from April and 2.4% year-over-year (y/y) from May 2016, the Bureau of Labor Statistics (BLS) reported on Tuesday. AGC posted tables and an explanation focusing on construction prices and costs. Final demand includes goods, services and five types of nonresidential buildings that BLS says make up 34% of total construction. The PPI for final demand construction, not seasonally adjusted, rose 0.1% for the month and 1.0% y/y. The PPI for new nonresidential building construction—a measure of the price that contractors say they would charge to build a fixed set of five categories of buildings—climbed 1.1% y/y. Increases ranged from 0.2% y/y for health care buildings to 0.5% for schools, 1.1% for industrial buildings, 1.6% for offices and 2.0% for warehouses. PPI changes for new, repair and maintenance work on nonresidential buildings ranged from -0.3% y/y for electrical contractors to 0.2% for plumbing contractors, 2.0% for roofing contractors and 3.3% for concrete contractors. The PPI for inputs to construction—excluding capital investment, labor and imports—comprises a mix of goods (59%) and services (41%). This index increased 3.2% y/y, outpacing the increases in the PPIs for finished nonresidential buildings and implying a squeeze on profits unless contractors can pass on cost increases or improve productivity. The PPI for all goods used in construction rose 3.4% y/y, as the sub-index for energy soared 12%, while the PPI for goods less food and energy rose 2.5% and the index for services climbed 2.8%. PPIs for inputs to seven types of new nonresidential structures had y/y increases ranging from 2.7% for industrial structures to 4.1% for power and communications structures. PPIs for inputs tonew residential structures rose 3.4% y/y for both single- and multifamily housing. Materials important to construction that had notable one- or 12-month price changes include diesel fuel, +8.1% in May and 23% y/y; copper and brass mill shapes, -3.2% in May but +14% y/y; steel mill products, +1.1% and 14%, respectively; aluminum mill shapes, -0.1% for the month but +10% y/y; lumber and plywood, +1.7% and 7.7%, respectively; gypsum products, -0.6% in May but +7.4% y/y; and cement, +3.2% and 7.1%, respectively. The Data DIGest is a weekly summary of economic news; items most relevant to construction are in italics. All rights reserved. Sign up at www.agc.org/datadigest .